This regal cat may well trace his ancestry back to the Russian czars, no one really knows but he certainly has the beauty and elegance associated with royalty. His playful but selective personality combined with an easy to keep, yet luxuriant coat have made him a favourite with those who know about the breed. 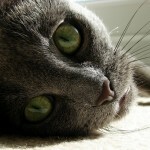 The Russian Blue is a medium sized cat, generally weighing 10 – 12 pounds. They have long bodies and fine bones although the density of their coat can make the bone look more substantial than it is. The body is slight but well-muscled and athletic. The tail is long, thick at the base and tapers to a tip. The head sits on a long and slender neck although it may appear shorter due to the thick, dense fur. The head is a modified wedge composed of seven flat planes. The combination of planes gives them a smiling effect. The ears are as tall as they are wide at the base and taper to rounded points. They are fairly wide set on the head, almost on the sides. The eyes are also wide set and almost but not quite round, in shape. There is still the slightest hint of the slant associated with Oriental breeds. The eyes are large and a distinctive emerald green in adult cats. In kittens they appear yellow but should gradually darken to green as the cat matures. The coat is always a short but very dense coat. It stands off the body at an angle and is so thick that you can draw lines in it that will stay that way until you smooth them over. It requires little to no grooming although they enjoy the attention that comes with being brushed. They are always solid blue. The individual hairs darken from lilac at the base to silver at the tips giving it a shimmery effect that adds to the breed’s regal appearance. Although the exact origins of the breed are unknown, it is believed that they made their way across Europe from Russia via boats that sailed from Arkhangelsk, which means Archangel in Russian. Some have suggested that they were at one point hunted for their coats but no one knows for sure. It has also been suggested that they descended from the cats of the Russian czars. Their thick, warm coat does tend to indicate that they had to withstand cold temperatures. 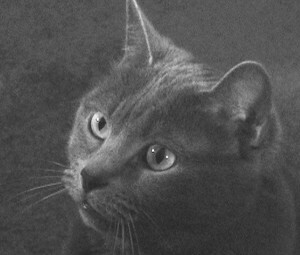 There were Russian Blues present at the first cat shows. They were exhibited as Archangel Cats and grouped together with other blue cats including the British Shorthair. Their natural reticence did not make them an ideal show cat and they frequently lost out to British Shorthairs until they were given their own class and labelled “Foreign Blue”. World War II put an end to the progress the breed was making and most of the breeding stock was lost. Breeders in various countries did their best to rebuild the breed using other breeds like blue British Shorthairs and blue Siamese. For a time, there was real dissonance in the appearance of Russian Blues when you compared the cats of one country to the next. Eventually, though the lines combined and the breed began to regain a consistent appearance across Europe. Although the Russian Blue came to the United States early in the 20th century, it did not receive much attention or become at all popular for several decades. It remained a poor choice for cat shows for much of the 20th century which made it less popular with breeders. 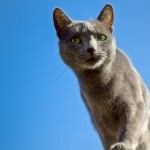 Then Russian Blue breeders began to concentrate on breeding less easily frightened cats and preparing them better for the noises and sound of a show and they began to gain in popularity. 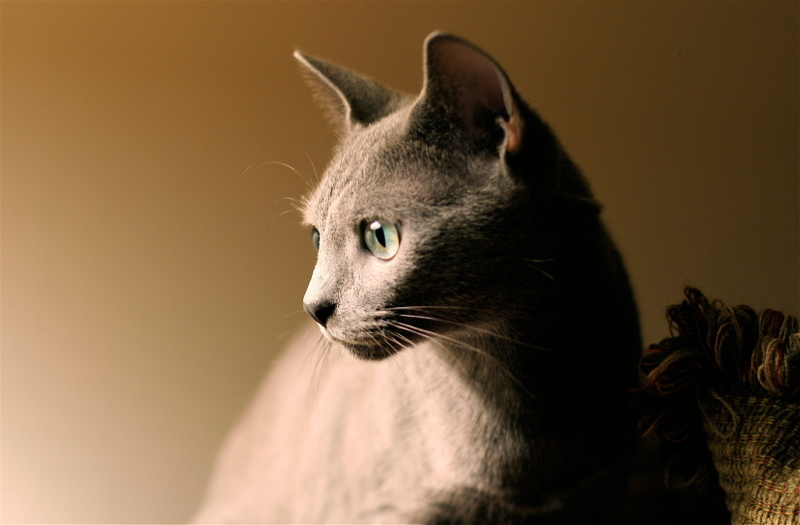 As a natural breed, the Russian Blue is quite healthy. They generally live long lives and are not prone to any breed specific diseases. They are known for a hefty appetite and keeping your cat’s weight at a healthy level is imperative. Obesity is the number one problems that vets see in their feline patients and it has many consequences. It is a key factor in diabetes mellitus as well as hypertension, cardiac problems, respiratory issues, and arthritis. It can also make surgery more complicated and recovery more difficult. Keep your cat at a healthy weight by encouraging him to get lots of exercise using toys to increase playfulness. Practise portion control rather than free feeding him and, if necessary, choose a low calorie food designed for weight reduction. Although it is tempting to offer lots of treats, keep them to a minimum and concentrate on lean meats, fruit and vegetables rather than overdoing the commercial treats which are generally higher in fats and sugars to increase palatability. 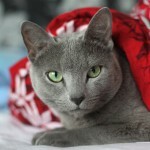 The Russian Blue is a playful cat with his family but can be very reserved and even shy with strangers. Having your cat decide to hide when guests are over is not uncommon. They can be easily startled as well, so they do not necessarily do well in homes with lots of loud youngsters. That being said, they generally like children and are willing to play and cuddle with them provided they are not overly rambunctious. They are independent and do not mind being left alone while the rest of the household goes to work or school. Once you’re home, they are happy to devote some time to cuddling and playing together. They are quite intelligent and many claim the cat will train you rather than the other way around. Fetch is a favourite game. They can be somewhat finicky and keeping the litter box clean is important as they will eliminate elsewhere if it isn’t up to their standards. They are easy going and tend to get along well with other pets including cats and cat friendly dogs. 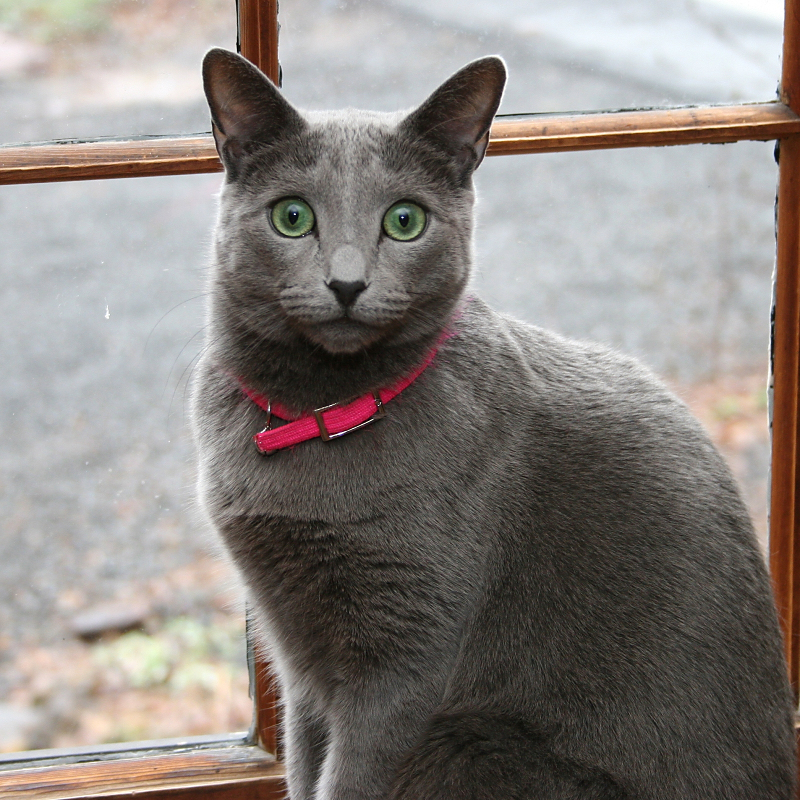 The Russian Blue can be an ideal choice for households where the family is away during the day. Provided that the children are older or calmer, they will adapt well to most situations. Affectionate and loving with their families and playful with the children they are an excellent choice as a family pet.